Are you searching for your dream log home? You've come to the right place. These incredible cabins boast cathedral ceilings, massive kitchens, wine cellars, swimming pools and more. Set on acres of seclusion from Montana to New York, here are 8 of the most stunning log cabin homes in America. This 6,435 sq. ft cabin overlooks the sixth fairway of Tom Weiskopf's Signature golf course. The inside looks like a castle with vaulted ceilings and winding stair cases. Oversized windows offer up some spectacular mountain views. This log home is situated on a lot surrounded by trees giving the ultimate luxury of peace and quiet. This 12,000 square foot hideaway sits on 58 acres only miles from Aspen. The great room alone takes up 3,500 square foot. Greeting guests int he great room are massive 35 foot ceilings. Also on the property is a guest house along a 7,000 square foot barn making this an ideal log home for horse lovers. A caretaker residence, auto showroom and riding ring also sit on the property. This immaculate log home sits on 60 acres of land in Park City. Inside you'll find many different living areas with cathedral ceilings. The dining area comfortably seats 20. A huge swimming pool, recreation area and gym are just a few of the many things you'll find inside this 20,000 square foot home. This breathtaking Montana retreat totals up to 11,000 square feet. Set on 160 acres this home floor plan is made up of 6 bedrooms and 4 bathrooms. A 630 square foot kitchen offers plenty of cooking space and is just steps away from the great room with 27 foot high ceilings. 172 acres surrounds this authentic Adirondack custom log home. The main house includes a wine tasting room. The cabin floor plan includes a two-story high living area that features a unique stone fire pit and waterfall. A 3,638 square-foot guest house with a floor to ceiling stone fireplace also sits on the property. 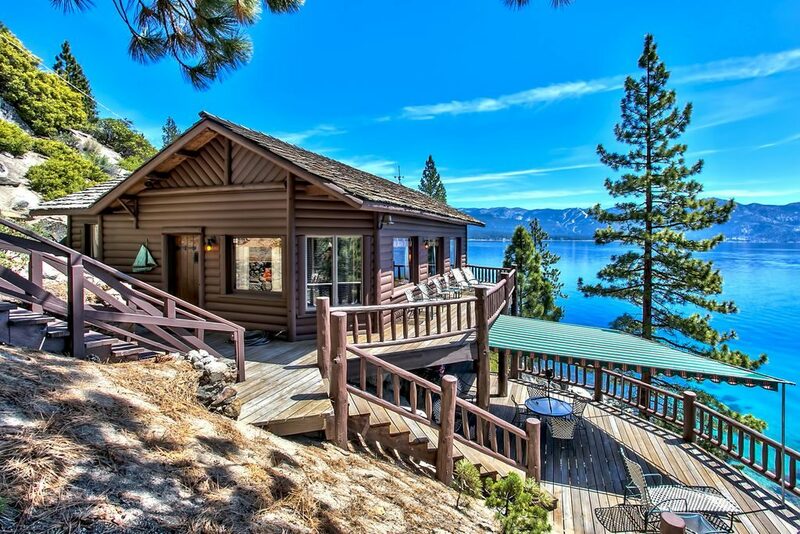 This cabin home sits on 4 acres nestled above Lake Tahoe and the property offers exquisite detail in its home design. The views are breathtaking and deck large enough for many to enjoy. Also on the property is a guest cottage, 4 car garage, its own pier and a boat lift. This waterfront property is 7,805 square-feet and offers plenty of outdoor courtyards to enjoy views well beyond your dreams. The high ceilings and wood beams in this open floor plan leave plenty of room for entertaining. No detail was neglected in this 5 bedroom, 6 bath Texas property. Wood and beams carry throughout the home for a true rustic feel. This stunning Tennessee custom log home is the perfect place to escape reality. Inside, the log home floor is made up of hardwood throughout. Two of every appliance can be found in the kitchen. This makes cooking a breeze. The best part of this 5,422 square foot home though is the basement turned luxury pool area.